The tongue sits on a plate in the center of the table. My dad has done nothing to disguise the inert muscle; it's long and plump, like the tongue from the Rolling Stones logo. I am 8 years old and horrified. I am horrified because meals are sacred affairs in our house. I've watched other children whine their way out of eating food as harmless as a tuna fish sandwich, but that is not the way in our house. In our house we are eaters of squid (clammy and pale), liver (pungent and soft), and Thai fish sauce (smells like a Bangkok gutter). But surely this tongue must be my worst trial yet. I nervously run my own tongue along my teeth -- a bad move because it reminds me exactly what I'm going to be eating. "Lunchtime," my dad says, slapping a gray slice on my plate. I grimace. My dad looks amused, then stern. It's his "there are starving people in China" look. I close my eyes and shove the slice in my mouth -- the tongue is rubbery, yet the flavor and texture is reminiscent of firm liverwurst. Swallowing is a struggle. I manage, and stare balefully at my dad. He takes a bite and chews. He is silent. To my amazement he puts down his fork and concedes culinary defeat, one of only two or three in his illustrious kitchen reign. He dutifully eats the rest of the tongue, but he never inflicts it upon us again. Flash forward to the winter of 2011, when my husband, Rich, returns from the neighbor's house carrying a bilious shrink-wrapped package. He smiles, proud. "Allen and Kristi gave us the tongue from that bull they just butchered," he says. I stare at him mutely, and make a mental note to get off the soapbox about scavenging and the financial benefits of taking a page from third-world cuisine. "Allen mentioned that Kristi didn't want anything to do with cooking the tongue. I told him you could make anything taste good, so he gave it to me." He beams at me. He has reason to be pleased -- we've been broke and I normally greet free food with appropriate enthusiasm. "Ahh -- " I manage. I try not to look at the package. Rich doesn't seem to notice, and he goes on, "I told them if you did cook it up, we'd have them over to dinner." I do not serve experimental meals to guests. As a general rule, I only experiment on family and unwanted houseguests. Once I've cooked a meal three or four times and ironed out the kinks, I'll serve it to visitors. I may not be a gourmand, but I have my vanity. "You told them what?" I choke out. My friend GH sympathizes. He buys his meat by the cow, and thus has a tongue in his freezer. "I have my doubts as to whether it'll be any good, but I'm thinking about smoking it," he tells me. GH is an expert with the smoker. I see a way out now. I'll give the tongue to GH. (No, there is no way to mention tongue this much without writing your way into sticky semantic corners.) He can smoke both tongues. I won't have to touch it, and yet it won't go to waste. Win-win. But not really, because I know it's a cop-out. I sigh. "How about you smoke the tongue and I'll make tacos de lengua, and then we'll have a dinner and compare," I say wearily. Great. Now I'm signing myself up for a dinner of two tongue dishes, with even more guests. The day before tongue day, I walk down to the field with Rich, who is making friends with Allen and Kristi's cows. Two new calves huddle in a pile of fresh hay beneath a cedar. The mothers and the new babies shun our carrots and celery, but the young black bull, who is being raised for food, is bold. He scarfs the carrots from my hand, showing his fuzzy black tongue. I scratch his head, look into his liquid brown eyes, and practice thinking: dinner. Eying his glossy flanks, I do feel kind of hungry. Not for tongue, though. The next day I scissor through shrink-wrap and the tongue flops out, pink and sandpaper gray. In order to pull away the plastic, I actually have to touch the flesh, and nausea roils in the back of my mouth. On the advice of my friend On the advice of my friend Laramie, who knows his food, I'm poaching the tongue for a spell before I remove the skin. With a slight shudder, I grab the heavy muscle. The surface texture is abrasive, like a giant cat's tongue. I maneuver it into a pot of water, wine and vegetables on the stove. My nemesis sinks below the surface, where it rests, curled like an alien fetus. I turn the heat to low. Free of the tongue for a few hours, I fuss over my pot of black beans and drive over to GH's to purloin a jar of home-canned tomatillos for my salsa verde. GH looks glum. His tongue has been brining for a week. "I really had to hack at it to get the skin off," he says, showing me a gray mass that looks whittled out of Styrofoam. "Mine isn't pretty either," I assure him. We commiserate over the upcoming dinner fiasco. When I return to my kitchen, I discover that the poaching process has made the tongue even uglier, which surprises me. I am reminded again of the movie "Alien." Once the tongue has cooled for a few minutes, I take a deep breath and then dig my fingernails beneath the slimy membrane that clings to the muscle's underside. The membrane is unresponsive. Next I try slitting the tongue's top skin. It does not, as the Web forum suggested, "peel away like the shell of a hard-boiled egg." It does not peel away at all. Somewhere during my 30-minute struggle to remove the tongue's rough gray skin, I come to terms with my carnivorous nature. If I can handle this, I think, I can do anything -- hunt, kill a chicken, gut an elk. As usual, I'm being pompous and ridiculous. Skinning a tongue with dubious success should not make me think that I'm ready to gut an elk, a much more difficult and involved procedure. But peeling the bumpy base of the tongue with a sharp paring knife is certainly a revolting process, and one that makes me very aware that I'm cutting into an animal that used to live at the bottom of my driveway. I do not throw up, and I do not quit. The tongue is finally skinned. It suddenly looks like beef. And for about 10 seconds, I feel invincible. When GH comes through the door he is grinning. "The brine recipe called for juniper berries, and I didn't have any, so I used anise and cinnamon, instead. I think it's going to be good!" he confides with the vaguely maniacal enthusiasm of a true food lover. By this time I'm feeling better about my own tongue. I actually got the nerve to sample a square of the cooked pink flesh, and it tastes pretty much like tender roast beef. The rest of the chopped tongue is standing by, ready for the final fry. I've salted the meat and tossed it with onion chives, garlic and chipotle juice. When the wok is good and hot, I add a tablespoon full of bacon grease. The grease forms a syrupy pool; the tongue hits the metal with a satisfying hiss. I let the meat fry for a couple of minutes. Meanwhile, I'm slapping corn tortillas on a hot comal. The table is already set with the accouterments: beans, salsa verde, GH's avocado relish, pico de gallo, sour cream, beans, limes, cilantro and chives. When the tongue is a little crispy, I transfer it to a serving dish and squeeze a fresh lime over the browned meat. Kristi and her son Tyler arrive with red wine and a carton of eggs from their chickens. As the forest fades to dusk outside our windows, we settle around the candlelit table. Allen appears a few minutes later, just in from milking the cows. I pour myself a glass of wine and look around, happy to be in good company with food on the table. To my amazement, the tacos are good. The tongue is not the most flavorful beef I've ever tasted, but it's super tender. And GH was right to grin about his offering. Beneath a salty sweet exterior, the smoked tongue is firm yet moist. It reminds me of really good pastrami. 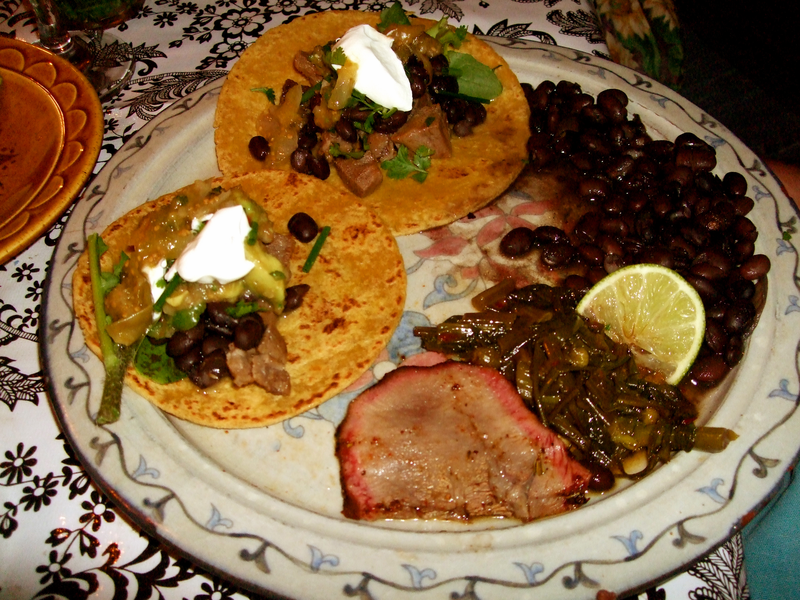 You'd think smoked tongue and tacos would be a weird combination but somehow it works. Add ingredients from Group 1 and turn heat to low.